The ancient art of Qigong combines movement, meditation and breathing to help restore the flow of vital energy (‘qi’) throughout the body. Previously, I assumed it was one of those exercises that was too slow, too simple to be of much benefit. I’d foolishly filed it under ‘things I’ll do when I’m 75’ along with moving to the countryside, learning names of trees and wearing a one piece. But anything that has been around for 5000 years deserves attention, and, in the last few years, it’s been getting a lot of it. A 2011 study from the University of Sydney found that cancer patients who practiced Qigong experienced significantly higher well being levels, improved cognitive function and less inflammation compared to controls. 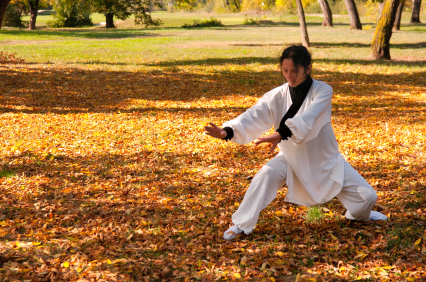 Qigong might also unlock the key to weight-loss. In the US, The National Center for Complementary and Alternative Medicine has recognized the efficacy of the use of qigong in maintaining long-term weight loss and is currently funding research to further document its effectiveness. Then there’s diabetes, migraine headaches, high blood pressure, autism and an addiction to heroin – all of which Qigong has proven helpful, according to scientific papers. But not many people read those. What has caught the attention of the public is one particular youtube clip. 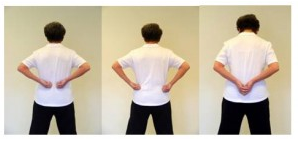 Tens of thousands of people have now seen video evidence of Qigong masters ‘dissolving’ a bladder cancer in minutes. The stunning feat occurred at The Huaxia Zhineng Qigong Centre in China, the largest medicineless hospital in the world. Since opening its door in the 1980s, the Centre has treated more than 135,000 patients with 180 different diseases – and has achieved an overall success rate of 95 per cent. ‘I want to be very clear about what the film shows and what it means. This film was created by Luke Chan, to illustrate the potential of Qi energy to heal the body. He is using a form of Qi Gong called “Chi Lel” and he is a master of this form. Mum decided Qigong was definitely something she wanted to add to her healing arsenal and she was thrilled to find that a local charity, Cancer Support WA, offered classes for just $5 for members ($10 for non members). The instructor Glenys Brown, is a medical intuitive and Qigong master. Her mission? To help people understand and use their inner energy abilities to improve their life. In just a few sessions she has provided Mum with practical tools to help her relieve stress and feel invigorated. Like Mum, Glenys also knows the power of Mother Nature. In one recent class, she urged students to go outside and choose one particular tree to draw/share energy with. 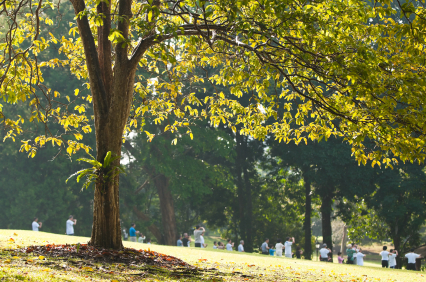 According to Glenys, every tree carries a different vibration depending on its appearance – whether it is spiky, flowering, flat-leafed – and its age. If you’re looking for the gift of longevity apparently you’re best off connecting with an old tree, that’s been there a long time, but if you need an instant lift, a sapling might provide more pep. Mum loved the idea of choosing a tree (or in her case shrub) to suit her energetic needs. During the class she kicked off her shoes to fill her body with the ground’s powerful healing electrons. 1. Adrenal and Kidney Massage. Before Or After Shower. The Adrenal Glands are under the surface at the top of each kidney. Form each hand into a loose fist with thumbs inside the fingers. Place hands on the middle of your back at the level of your waist. Gently massage the middle (waist area) of your back (kidney acupressure points) with gentle rotations by the backs of the knuckles of the hands and up to the finger knuckles (the outside of your fists). Do 36 rotations. At the end of the rotations, lightly thump down the base of the spine to remove more energy. If you have problems with your kidneys, then next use the palms of your hands to massage the base of the spine for 3-4 minutes. That is a great post Laura and I can personally testify to the power of prayer as a powerful tool for healing. Back in October 2000, I organised several groups of people from several districts near my hometown to pray for a 33 year old mother of 3 young children, all under the age of 5, who had been diagnosed with an aggressive form of Cancer. Over 3 consecutive Sundays, at exactly the same time and for just 3 minutes, we all sat quietly and sent out our prayers and healing thoughts. When this lady went back to the hospital a few weeks later for an operation, the cancer had gone! The Professor dealing with the case was baffled and could offer no explanation. Harry Edwards, was undoubtedly the UK most famous and gifted spiritual healer and founded the world renowned healing sanctuary Burrows Lea almost 60 years ago, in the lovely village of Shere in Surrey http://www.harryedwardshealingcollege.com. At 10am & 10pm every day, people in 95 countries around the world join with the Sanctuary to focus their thoughts on healing for those in need and for world peace. The sanctuary also runs courses on how to become a healer. David R Hamilton describes so well how Quantum physics is beginning to prove the reality of thought and prayer as something of real power and substance and not just something of the mind. We already know how adversely, stress can affect us physically through negative thoughts and emotions, so it should be no surprise that positive, happy and loving thoughts should have the opposite effect, nature always provides us with a balance. I have nominated your blog for the “Shine On” award for blogging. Please accept this honor in recognition of your great new blog. Visit the site at the end of this message to read the rules and responsibility of accepting this award. P.S. I realise you may not wish to participate in this as your blog is more like an informative journal, so don’t worry if that is the case, but it was an excuse to plug your site to a few people as I believe the more people that know about it the better! Thank you so much Eleanor! I hadn’t heard of the Shine On awards but I love the idea. Your photography is beautiful – especially your picture of the Mexican Jaguars. I’m away at the moment but when I have some more time I will definitely nominate 15 myself. Thank you again for thinking of me! Do you know when and why the hospital was shut down? Hi Judith, I am not sure why it was shut down, but I would be very interested to know! Your writings are lively and thought provoking. Are you able to set out how your mum is going at present. Also something that puzzles me is the lack of any mention of the father of the family. Knowing how or where he fits in would round out the picture for interested readers. I am studying and practicing with Master Mingtong Gu who trained as a Qi Gong Master under Dr Pang at the medicineless hospital. It had to close for political reasons. In China gatherings of more than 100 people are banned. Anyone who has written books and has a foreign following may be a religion so cannot practice. We are blessed that the teachings are available in the West. Chicenter is based in Petaluma CA. USA.